ALL JAN SHEUERMANN wanted to do was feed herself some chocolate. She ended up piloting the world’s most expensive fighter jet. Sheuermann is quadriplegic, unable to move her arms and legs due to a neurodegenerative disease. So when scientists from the military’s future-science arm Darpa and the University of Pittsburgh’s Human Engineering Research Laboratories approached her in 2012 about plugging her brain into a robotic arm, the most she hoped for was the ability to serve herself some candy. Two years later, towards the end of her stint as a neuromotor guinea pig, the scientists changed the game. 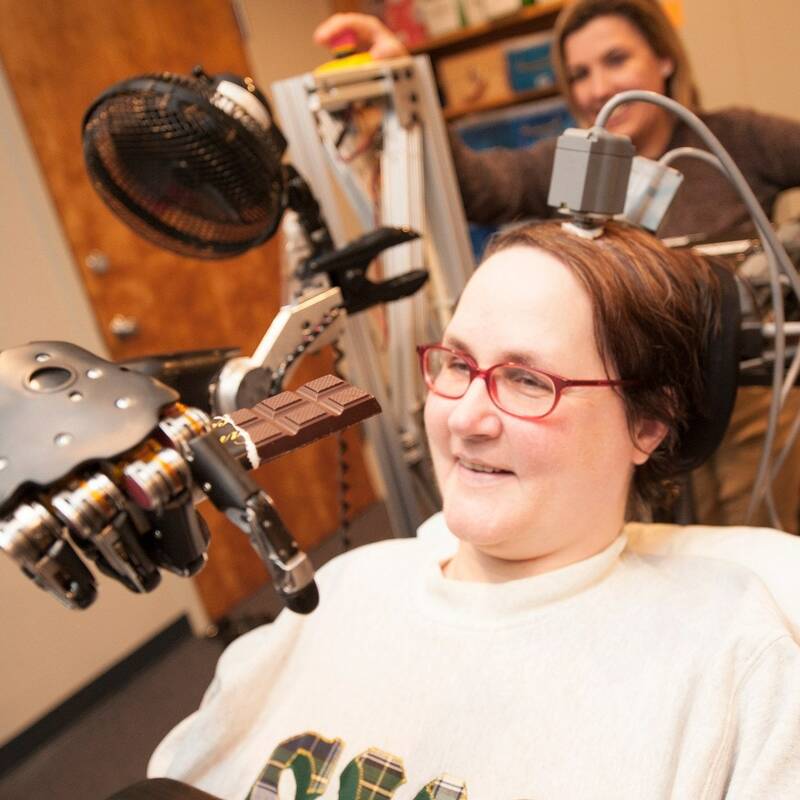 Instead of connecting Sheuermann’s brain interface to a robotic arm, they connected her to a flight simulator. She’d use the same neural connections to pilot an F-35 Joint Strike Fighter—the military’s next-gen attack jet. And despite the fact that the agency unveiled the flight at a February 24 security conference called “Future of War, Darpa officials insist Sheuermann is not a test pilot for a new generation of mind-controlled drones. No, this research was conducted under Darpa’s Revolutionizing Prosthetics research track, which is geared towards better robotic arms for injured veterans. “We are thinking about exactly how to restore function after injury, how the brain can be used to actuate devices,” says Justin Sanchez, the head of Darpa’s prosthetics research. He says projects like this are helping push the limits of what is possible with artificial neural circuitry. The idea of a neural interface for computers isn’t new. The first brain-controlled videogames go back to 2006, when a team of scientists at Washington University in St. Louis built an interface that let a teenager with epilepsy control Space Invaders. The idea is that instead of using purpose-specific neurons to control a purpose-specific device—like a cochlear implant, or some prostheses—you could build an interface between the brain and any computer, and then the computer could do a range of tasks—from gripping a candy bar to performing a barrel roll. Sheuermann’s imaginary fighter jet flight wasn’t her first foray into controlling virtual objects with her mind. She trained to use the robot arm by controlling a virtual one on a computer screen. Her neural activity gets picked up by a four-millimeter-wide sensor embedded in her brain, 96 microelectrodes—Sanchez calls them “pips”—each trained on a different cell. “When you put them on the motor cortex, the pips get very close to the cell body and can record whenever one of those cells fire,” he says. His team simply reprogrammed the output of the electrodes so that instead of controlling the movements of a robotic arm, they controlled the altitude, pitch, and roll of an onscreen fighter jet. “I think what we’re getting to is understanding the processing that goes into the brain,” he says. But let’s not get too far ahead of ourselves. Because if Darpa is, hypothetically speaking of course, trying to build squadrons of brain-powered fighter drones, they’ve got a long way to go. The video below shows Sheuermann’s shaky flight skills. If she was in a real combat simulation, she’d be aced by bogies in no time. And there’s no way she’d make it past the mid-air refueling challenge. Granted, Sheuermann is not a pilot in real life. (She writes mysteries, actually.) But the project faces even bigger technical challenges. Sanchez admits that he and his co-investigators still don’t know exactly how neurons control movement. And even if one day they were to figure our which neurons triggered which motions, these connections rewire themselves day to day, as the brain gets better at new tasks. This matters when using those neurons to control things outside the body, because the microelectrodes on the interface are each assigned to a specific group of cells. The real achievement here is reprogramming the same neuronal wiring that controlled a robotic arm to fly a virtual fighter jet. “Fundamentally it’s demonstrations like this that change the way that we think about the way brain does work in the world,” says Sanchez. It’s an early step, but he says this raises interesting questions about whether humanity could one day outgrow physical interfaces with its machines. This is about more than just video games—it’s about finding a fundamentally new way to interact with the virtual world, and maybe even the real one.